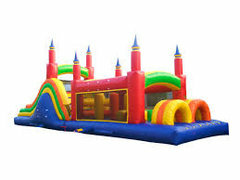 Obstacle Course Rentals | Premier-Inflatables.com Avon IN. Get your teams together and get ready for an awesome time! These exciting inflatable obstacle course keep everyone entertained for hours as players race to see who finishes first. As much fun to watch as it is to participate, contestants will crawl through tunnels, navigate popup barriers and scramble up the climb and slide to make to the finish. The ideal choice for large events, school and church carnivals and company picnics. All of our obstacle course rentals are manufactured with "lead-free" vinyl, and are cleaned and sanitized before every rental for your child's and your guest's safety. Browse the selections below and click on the image or "More Info" button to get additional information and to make a reservation. Mega Obstacle Course - Coming Summer 2019!